It is very rare culture in Kagoshima! Young men dress up like a woman and take a face of a monkey and a long-nosed goblin. 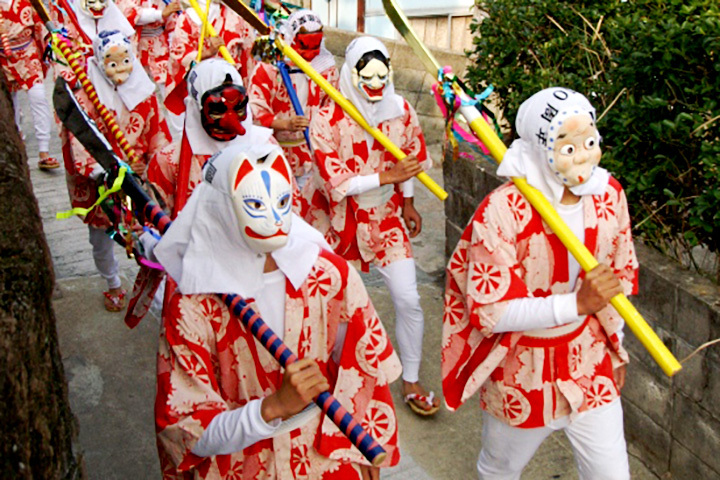 They walk in the town while shaking a wooden spear. This festival is that people wish healthy, and it's rarely seen in all Japan, as well as Kagoshima. 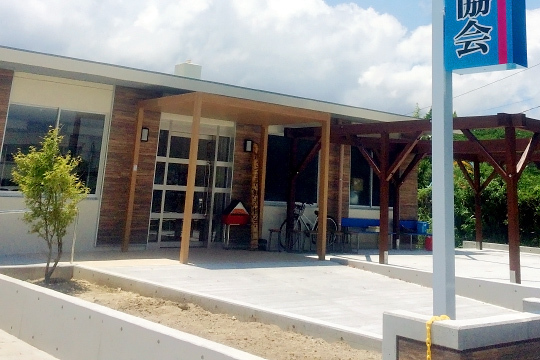 Please contact Minamisatsuma Tourism Association about the detailed location and time. Once all are gathered, everyone forms together as a single group to do the traditional Kagoshima "Ohara" dance as a team. The Official Road of the city closes, and several dance teams gather matching in their distinctive team colors. There is also plenty to eat and buy as a lot of food and souvenir shops never miss out on attending this amazing event. You are also welcome to participate in this festival as a team if you come with 10 or more of your friends. Please contact Minamisatsuma Tourism Association about reservation. It is a festival offering gratitude to the brilliant full moon for the bountiful harvest. People attending this festival can also get a mouth full of traditional Japanese "sweet dumpling". It is held on August 15th (according to the lunar calendar) every year. 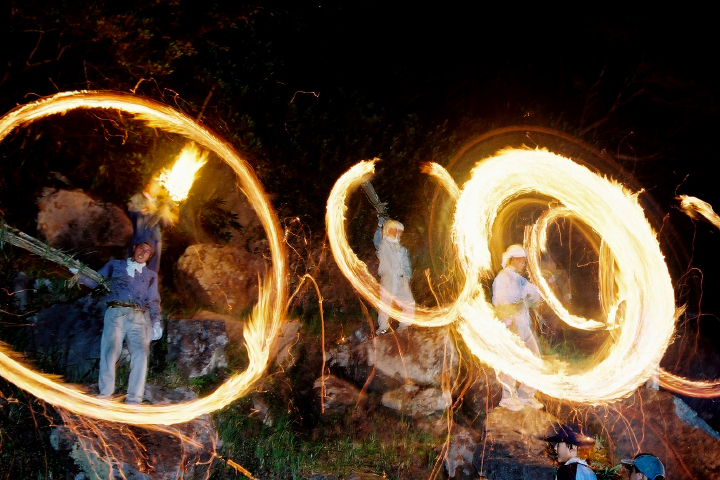 The photo above is "Bounotsu Hitoboshi (Torch)". Ladies walk as they did then along the seaside in elegant kimonos. It is started in Bounotsu during the Muromachi period with people from Kyoto who were missing their hometown. The long-nosed goblin and lion walk in front followed by 12 girls and a group of traditional instrument musicians. You may participate as a long-nosed goblin as well. 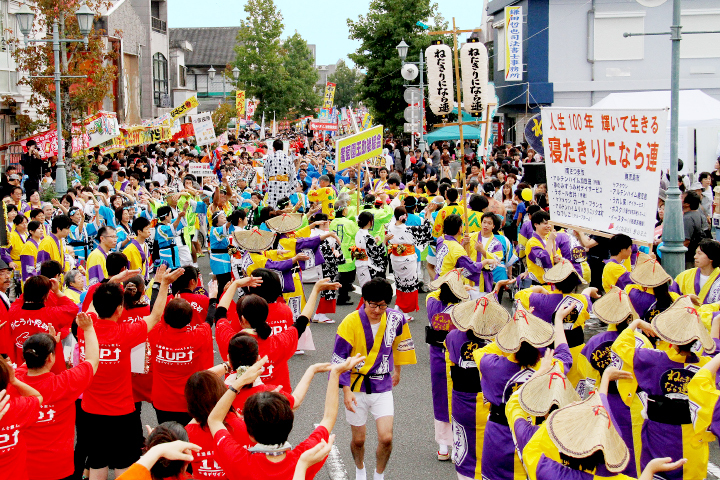 There are a lot of festivals and traditional events in Minamisatsuma. Please have a look the following address for more information. The biggest spring event in Kagoshima! 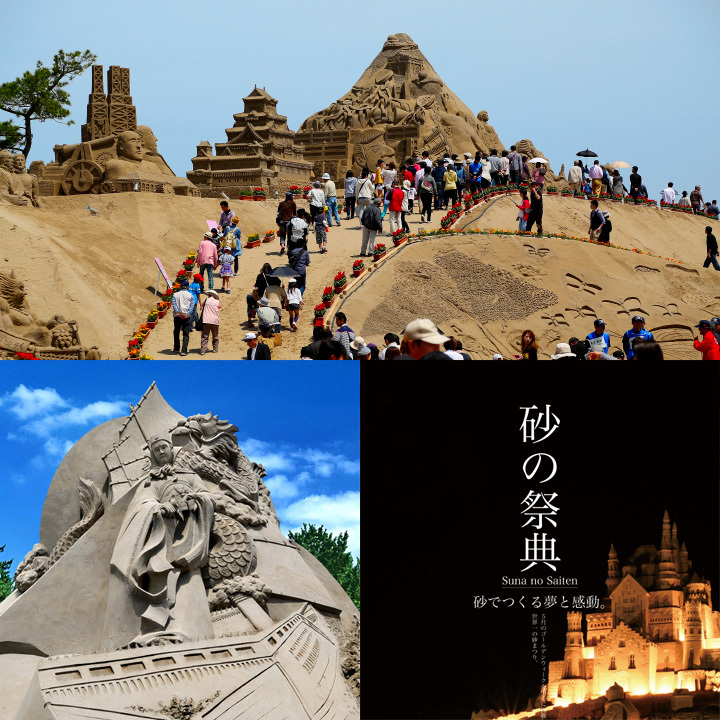 The Collaboration of sand sculptures, fireworks and illuminations. These sophisticated and artistic Sand Sculptures astonish visitors every year; some of sculptures are over 10 meters tall. 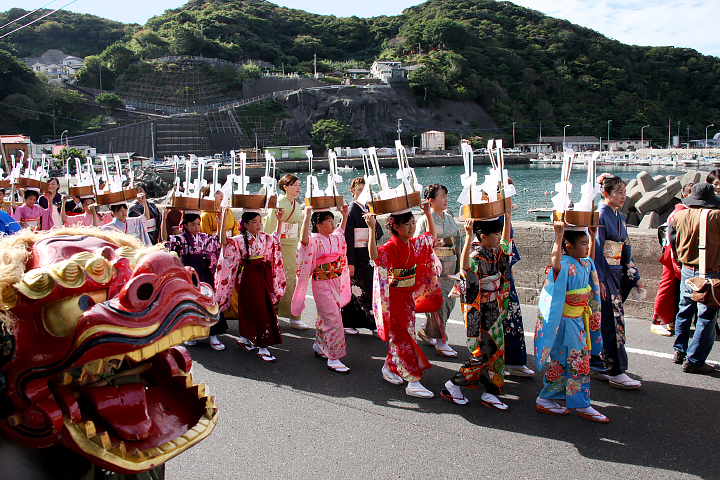 It is a Kagoshima special event famous enough to have had attracted local, national and international artists alike. Quality restaurants and local specialty vendors participate in the event. There are also a variety of stage performances to enjoy including concerts starring well known singers. 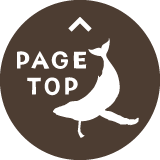 More than 100,000 people visit and enjoy it every year. This event takes place in May, and features a spectacular fireworks and illumination exhibition during the Golden Week period of consecutive national holidays from around May 1st～May 5th. It takes 50 minutes to get here from Kagoshima City by car (1,600 spaces for parking). During Golden Week, there is a shuttle bus from the Kagoshima Central Station coming to and from the event. 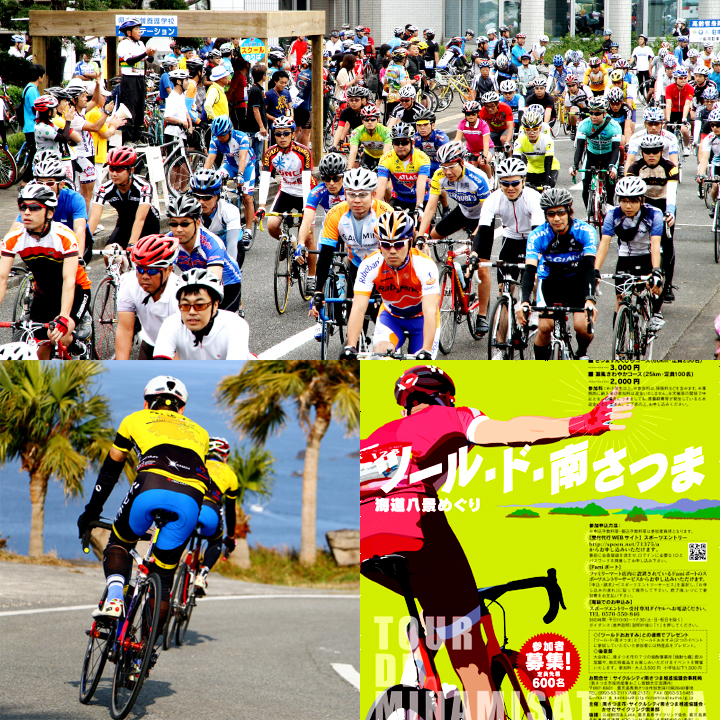 It is the competition that ride around the “Eight Seaside Spots" in Minamisatsuma. The longest course is 100 km, setting the intense coastline of a heave. *The insurance is included in the charge. *Even if the competition would be cancelled by bad weather, we can not repay it. Following the footsteps of Ancient monk! Chinese high priest 'Jian zhen' arrived at Bounotsu (Minamisatsuma) after 6 times of voyage. 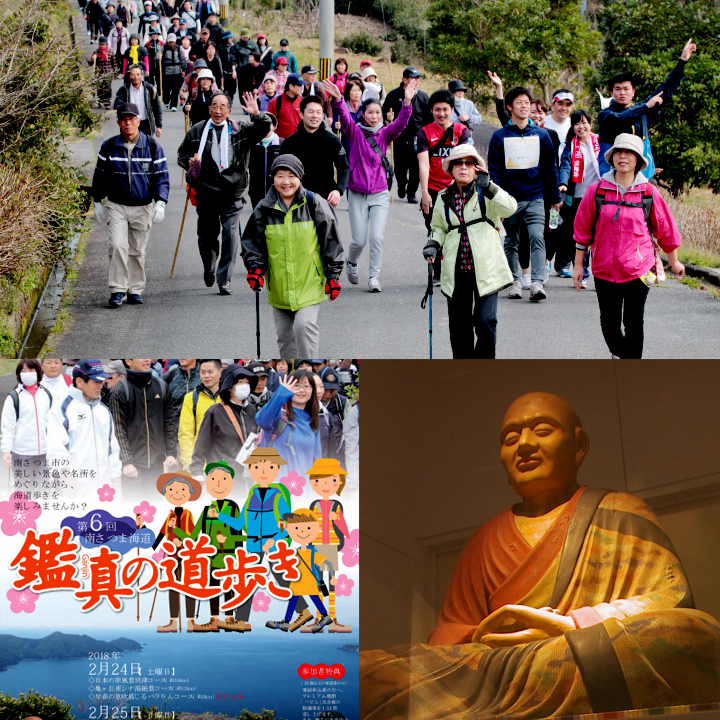 This is a walking event that comes from the name of him, brought Japan Buddhism precepts. You can also receive special hospitality of local foods.